School visits to our displays of the national collection of modern and contemporary art at Tate Liverpool are free. There is a charge for special exhibitions and some school activities in the gallery. Tate Liverpool welcomes school visits weekdays Monday to Friday. On these days groups are welcome to use our free Learning resources or book one of our gallery talks. 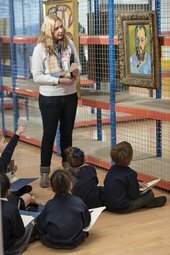 Audio guides can be purchased for schools at the discounted rate of £1.50 per unit when visiting selected special exhibitions and displays. Subject to availability, please book in advance. All groups must book in advance, whether visiting independently or taking part in an activity. The maximum size of a visiting school group is 60 students. Please split larger groups of students into groups of no more than 20 to walk around the gallery. Please advise us of any learning resources or activities that you would like to book and if you would like to book a locker or the lunch room. When booking your visit, please advise us of any specific access requirements members of your group may have (for example if they are are blind or visually impaired, deaf or hearing impaired, wheelchair users or in need of mobility support, or have a learning disability). Please note this is only an enquiry into availability, if we have the facilities to book you in at the time of receiving this email we shall do so and notify you accordingly with a confirmation letter and a booking reference number. Sending us an email is not confirmation of a booking. Please note that teachers are responsible for students’ behaviour and safety at all times. All group leaders should carry out their own risk assessment prior to their visit. At no stage can Tate assume the formal duty of care on behalf of teachers. Coach parking is available at the Kings Dock Car and Coach Park, charges apply. Please arrive at the time you are booked in. The group leader should register at the information desk in the foyer and collect their group leader identification badge. If you have booked lockers, you will be directed to them for students to leave bags and bulky items. A packed-lunch room (for a maximum of 30 students for 30 minutes), cloakroom and lockers are available for use during your visit. Please book these in advance. To avoid congestion in the shop, please ensure that pupils visit in small, staggered groups and are supervised at all times. We're working on a brand new schools resource, which will be coming soon. Keep an eye out here for more details. Introductory talks are available for the Tate collection. Talks are also available for special, temporary exhibitions (exhibition tickets also required). The 30-minute tours are led by our experienced, knowledgeable and friendly Visitor Assistants designed to suit the key stage of the group. Price: £25 for a gallery talk; £75 for an auditorium talk. Maximum size of group: 20 students for a gallery talk; 60 students for an auditorium talk. To book please call the Box Office on + (44) 151 702 7400. Tate Collective Liverpool meet regularly to plan and deliver creative events, festivals and opportunities for other young people aged 15–25 years that are inspired by the art on display in our gallery. Send us an email if you want to get involved! Students can achieve their Arts Award qualification at Tate Liverpool. Send us an email to find out how we can help support you. We strongly recommend you visit Tate Liverpool in advance to check the suitability of the artworks for your group. You can also use our online resources to plan your visit to the gallery. If you are planning a visit to a special exhibition and would like to make a preliminary visit please call +44 (0)151 702 7400 or email visiting.liverpool@tate.org.uk to arrange a complementary ticket. 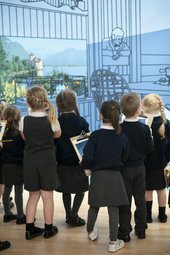 To ensure a successful visit, please read our guide for school visits to Tate Liverpool carefully. Please also be aware of our gallery rules.